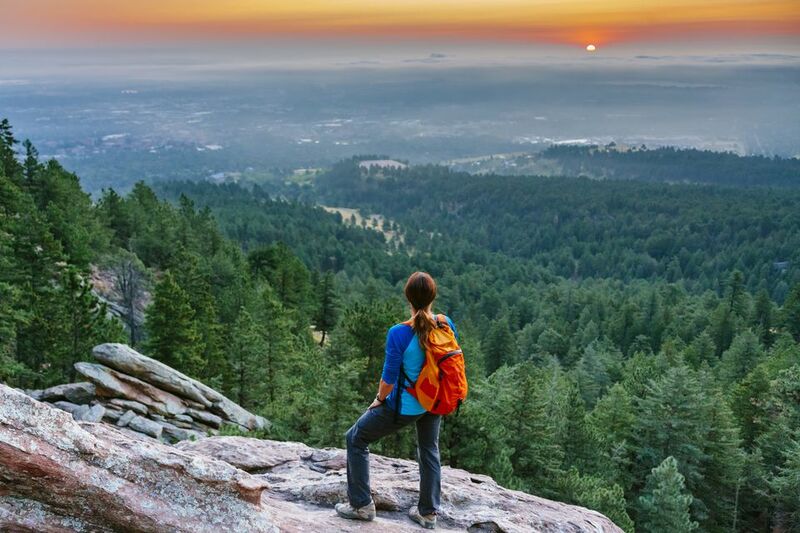 The state of Colorado is a hiker’s heaven, with nearly unlimited opportunities to hit the trails no matter where you are, from Fort Collins to Durango. However, Boulder is one of the best destinations for hiking because of its proximity to the mountains and the wide range of options within a five-minute drive from town. As well as being home to some of Colorado's top breweries, Boulder is also located in the middle of the I-70 Mountain Corridor, which opens up limitless possibilities for mountain hikes. Sometimes, though, you won't have time for a lengthy excursion through the hills, but fortunately, there are a number of short hikes you can complete in an hour or less nearby. From the Foothills Trail at the Hogback Ridge Loop to a short walk to Boulder Falls, take a few hours out of your trip to Boulder to immerse yourself in nature and enjoy some of the best views in the Colorado mountains. Located at the very north end of the city of Boulder, just about a half-mile past where Broadway merges with 28th Street, the Foothills Trailhead offers a variety of different hiking trails leading into the foothills. From here, you can take the Hogback Ridge Loop in just about an hour and a half at a steady pace. The two-mile hike takes you up and over the north Boulder foothills, with good views of the snow-capped Rockies at the top. At the start of the Loop, you can veer right and take a steady incline to the crest of the hill. After climbing up about 1,000 feet, you'll be at the top of the ridge and get a great look out over the foothills to the west and Boulder and the plains to the east. After you're done admiring the view, it's a downhill journey to complete the Loop, which leads you right back to where you started. Getting There: Drive north on Highway 36 (28th Street) past where it merges with Broadway. Continue north for less than a half mile before turning right into the parking lot at the Foothills Trailhead. You can then take the Foothills Trail underneath 28th until it meets the Hogback Ridge Loop. Sanitas is one of Boulder’s most popular hiking spots, and while it’s on the long end of the “short” hikes, you can still knock out the round trip in two hours. If you’re looking for a workout, this is a good one; the three-mile loop ranges from moderate to strenuous. Follow the well-marked trail around the back of the sandstone peak, but be prepared for the hike to get more difficult near the top. At the summit, there are plenty of good spots to take a break and take in the views of Boulder, and the downhill journey is relatively easy on the way out. Getting There: ​In Boulder, take Broadway north and turn left (west) on Mapleton Avenue. Head west until you see signs for the Mount Sanitas Trailhead on the right. There are a few parking spots along the road, but if they’re full you can find parking in one of a few small lots near the trail. Lichen Loop is a short and easy hike in the Heil Valley Ranch park that you can complete in around a half hour. The trail is also generally less crowded than other trails because it takes a little longer to get to from Boulder. The loop starts by crossing a bridge over a small creek, and after that is essentially a gentle climb up through a thin pine forest. The climb is only a few hundred feet up in elevation total, but you still get decent views of the surrounding area at the top. Getting There: Take 28th Street north to Left Hand Canyon Drive (about four and a half miles past Broadway), then take a left onto Left Hand Canyon Drive. Less than a mile later, take a right onto Geer Canyon Road; then follow the road about a mile and look for signs for the trailhead, which will be on the right. There are multiple options for quick vertical hikes up the Flatirons. Starting at the Chautauqua Ranger Station, you can choose a trail to take you up Flatiron Number 1, 2, or 3. The hikes generally gain 1,500 feet of elevation and run 90 minutes to two hours round trip. The Flatirons hikes are some of the best in town because they take you up Boulder’s signature feature and offer a great elevation gain in minimal time. Flatiron Number 1 is the best trail for first-timers, so start there and move on to 2 and 3 on your next outings. Getting There: Park at the Chautauqua Ranger Cottage, which can be reached by taking Baseline Road west past Broadway. The parking lot is often full, but ample street parking assures you’ll almost always get a spot at this crowded trailhead. Head west through the main meadow toward the Bluebell-Baird Trail junction, then follow the signs for whichever Flatiron trail you choose. Doudy Draw Trail travels south from the trailhead along the draw and joins up with the Spring Brook Loop Trail. You'll then cross a small creek and veer off to the east up the slope to the Flatirons Vista Trails. The rich savannah ecosystem includes the area's famous ponderosa pine trees and has a rich history of mining and agriculture. As you hike, you might notice the ditches constructed for crop irrigation as well as the diverted routes of the South Boulder Creek like the Community Ditch, which was originally constructed in the early 1900s. Getting There: From Boulder, head west on Eldorado Springs Drive (Highway 170) about 1.8 miles west. The trailhead is right off the exit, and there is a parking lot that charges a small fee for using the facilities. You can access several other moderate trails including Community Ditch, Flatirons Vista Loop, Spring Brook Loop, and Goshawk Ridge from the trailhead.